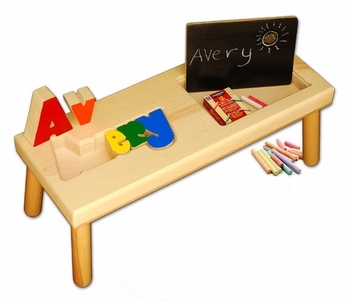 We couldn�t resist adding a little chalk board to our ever-popular baby name seat, the unique, personalized puzzle stool. Ideal as a new baby gift or first birthday present, this thoughtful present can help them learn letters, colors, problem solving and, of course, their own name! This model also includes a clever little storage tray with a black board on the lid that will encourage creativity and dexterity. As they get older they can use it as a step stool to reach the sink and other out of reach spots. Proudly made in the USA, each seat is custom built to order and constructed of furniture quality wood. The letters are available in your choice of primary or pastel colors with a maximum of 8 letters for the name. Please click on More Images above to see the pastel version and other options. The seat measures 9 by 24 inches and is 9 inches high. All paints and finishes are water based and non-toxic for safety.